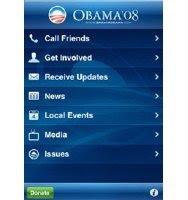 Democratic presidential candidate Barack Obama's campaign team has released an application specifically for iPhone users to help supporters of the candidate connect with others and get involved, stay up to date on breaking issues and more. The free application—available for download through the App Store—is compatible with the iPhone and iPod touch. It will organize your contacts by key battleground states, and measures statistics to see how you are doing compared to other leading callers. It also provides you with information about the campaign via text messages and e-mail, offers coverage of national and local campaign news, helps you find local events, share the information by e-mail, and get maps and directions. You can also use the application to browse videos and photos from the campaign. Presidential election season is always contentious, but increasingly tech-savvy pundits, campaigners and others have turned to new ways to get the news out. The Obama campaign is wading into water not yet swum by the McCain campaign, it seems—there isn't, as this story was posted, a McCain-centric app available for the iPhone yet. But there are plenty of politically-oriented applications for the iPhone and iPod touch available for download from the App Store.